Cashews are an excellent source of protein and magnesium. They have no cholesterol, and contain high levels of healthy, monounsaturated fats. Cashews were originally found in Brazil. Traders spread cashew seeds to Africa and India, now the largest producer of cashews in the world, with Brazil second and Africa third. 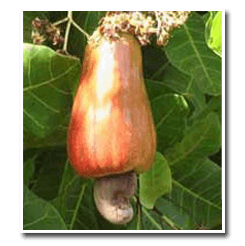 Unlike other nuts and seeds the cashew does not grow within the fruit but instead on the outside of it, hanging from the base of a crab apple, called a "cashew apple." The apple itself spoils too quickly for distribution but is enjoyed locally. East Wind Cashew Butter Cashews are nuts which grow from the bottom of apple-like fruits on cashew trees (left). The nuts have two shells with a bitter liquid layer between them. The nut supplier applies heat to remove the liquid and make the shells brittle enough to crack and remove. So "raw" cashews are not completely unprocessed, but are as close to raw as is available on the market. East Wind's cashews usually come from Brazil. To make raw cashew butter, we lightly roast the cashews. This removes excess moisture but does not change the color or taste. Roasted cashew butter has a darker color and a rich roasted flavor. Small amounts of high-oleic expeller-pressed safflower oil are added to our Cashew Butters during milling to provide a spreadable consistency. No preservatives, sugar or salt are added. Cashew butter is wonderful on bagels. And, it works great as a peanut butter replacement in smoothies and your favorite recipes. 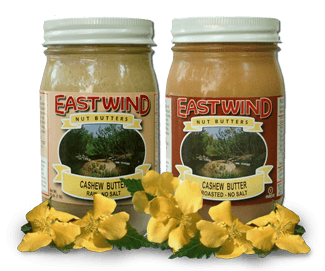 You can get East Wind Raw or Roasted Cashew Butter in 16-oz. glass jars (4-pack), 16-oz. glass jars (case) or bulk, in 15-lb. buckets, or 35-lb. tubs.